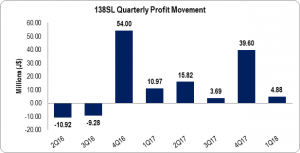 138SL’s Income increased by 77% to $191.63 million relative to the $108.04 million recorded for the comparable period the prior year. The company noted that, “Revenue for the current quarter to December 31, 2017 was not at its optimum and was lower than expectations. Other Operating Income rose 3% to $7.27 million (2016: $7.06 million) for the period in review. As such, total income for the quarter amounted to $198.90 million compared to $115.11 million booked in 2016. Administrative expenses increased by 56% to amount to $85.17 million $2016: $54.68 million). The company indicated that, “In the quarter ended December 31 2017, expenses increased by 56% reflecting the increased level of operations consequent on the bringing into operation of a total of 672 rooms.” Operating profit amounted to $113.73 million, an increase of 88% compared to $60.43 million that was reported for the comparable quarter in 2016. The company also reported finance cost of $112.68 million (2016: $56.93 million). The company recorded $3.21 million as preference shares interested for the quarter relative to nil in 2016. Losses before taxation for the quarter amounted to $2.16 million compared with the profit of $3.50 million for the first quarter of the 2016FY. Following a tax credit of $7.04 million (2016: $7.47 million), net profit totalled $4.88 million, this compares to a profit of $10.97 million recorded in 2016. Earnings per stock unit for the period amounted to $0.012 relative to earnings per share of $0.026 and the twelve month trailing EPS $0.15 the amount of shares used in this calculation was 414,500,000. Notably, 138 closed the trading period on February 13, 2018 at a price of $6.15. As at December 31, 2017, total assets increased by 27% to $8.13 billion (2016: $6.38 billion). This increase was primarily driven by a 65% increase in financial asset-service concession to $7.26 billion (2016: $4.39 billion). Construction in progress was nil as at December 31, 2017 relative to $1.20 billion as at December 31, 2016. Shareholders’ equity totalled $2.74 billion (2016: $2.09 billion) which resulted in a book value per share of $6.61 (201: $5.04).